Wowsa! It’s hard to believe it’s already been 6 months. And it’s difficult to believe it’s *only* been 6 months. Each week we have offered classes and learned SO much. This is a shout-out to each student in each class… you have helped us in ways you will never know. If you were brand new to this… You were probably a little anxious but overcame your fears! You were actually our ideal participant. 🙂 You proved to yourself you could do something you never thought you could do. Now just imagine all of the things you will be able to tackle! 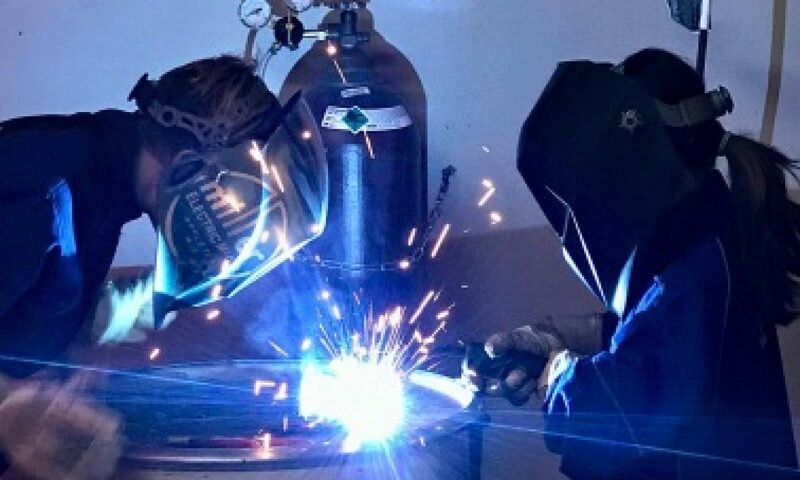 Maybe you will return for another class; maybe you will incorporate welding into some other art you already create; maybe this will be your only experience cutting and welding solid steel but you will remember how badass you felt when the metal fell below your fingertips as you moved the torch. If you were a slightly experienced person who hadn’t welded in years, we thank you for coming back around to a really empowering hobby that sometimes turns into a lucrative career. Whether you weld for fun in your she-shed/man-cave or have reignited the spark for a career in welding, we appreciate you. On occasion, we have worked with experienced welders who hoped to improve themselves as welders and wanted to learn about troubleshooting welding power sources. Fortunately, you found the right nerd to help you along on your journey. 😀 Please consider us a resource. We want to assist you as you grow your skills and business. We’re live and you’re AWESOME!! !